Below is the schedule of registration and services offered, courtesy of PRC. PRC said that the certificates requested will be issued after the oath taking ceremonies. The results of March 2018 LET was released on May 23, 2018 or forty (40) working days after the day of exams. As announced by the board, 13,774 elementary teachers out of 58,323 examinees (23.62%) and 22,936 secondary teachers out of 76,673 examinees (29.91%) passed. The next schedule of LET will be held on September 2018. As of this writing, applications are still ongoing. Below is the detailed schedule. Paano po magrequest ng Good standing at Certificate of ratings? May requiremets po ba? Pupunta po sa prc mismo para po mag verify ng rating. Hnd p po kasi available online. Kung like mo ng may certificate may bayad po un. Any updates on the online Initial Registration? It's June 5 already and the system is still under maintenance. Hello PRC? When will you ever learn and improve? You are causing too much inconvenience to people. Hi PRC, for alternate solution, pwede b magpunta na lang kmi to any PRC office for Initial Registration? paano po kukuha ng Duly accomplished Oath Form? sana po may magreply salamat po. mag initial register po muna kau..sa prc mkukuha ang oath form. teachers? paano po makukuha ung Duly accomplished Oath Form? The site is still under maintenance. Please provide an alternative solution on this. Thanks! Hi guys, just want to share this with you all. I was lucky to see my rating online. Good thing that I took a screenshot of my score before I closed page. When I went back on the page to check it one more time and test if it's really working, the page can no longer be displayed again. I've been checking their website since Monday whenever I have time at work. I think that the website can accommodate a certain number of online users since thousands are using it simultaneously. Anong valid Id ang hinihingi sa initial registration ng let passers? Taking po kasi No.1na kailangan sya. pede po malamn kung pano mamakap initial registration??? Bakit po nawala ang gcash sa payment options....? kailangan pa po bang pumunta ng designated school para sa initial registration? anong purpose ng initial registration online kung pupunta pa ng school fo initial registration? Kailangan po bang pumunta sa designated school para sa initial registration? Eh anong purpose ng initial registration online? Sobra excited mga board passer SA let. Relax lang makukuha nyo rin PRC ID nyo at board certificate. paano po mag initial register? 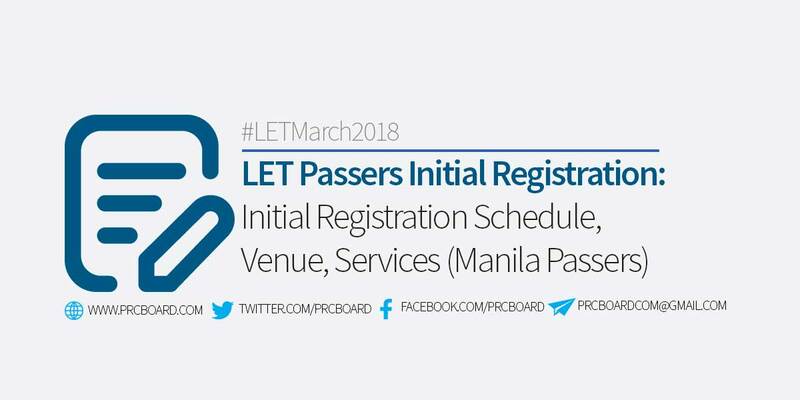 May walk in na po ba sa Cebu for registration of Let pasers 2018(????????). We came there last June 22 , and went home bringing nothing. We spent money going there, took absences of our work but boom!! I could say WHATAWASTE!! Even their online system , wattawaste! good day po mam/sir! ask lo lng po kung may expiration po ung pag avail ng prc id card? higit one year ko na kasing ndi pa nakuha mula ngaun at king pwede po bang kunin un sa ibang branches ng prc aside sa regional prc offices kung saan ka registeredduring the exam?